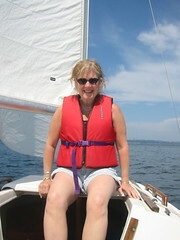 Southworth Sailor: I got her on the boat! As you know, my passion for sailing is tolerated by my wife, but not exactly shared. Today, she obliged me by joining in an Independence Day Sail. The wind was perfect for a smooth, yet swift cruise around Blake Island. Her stiff legs from yesterday's hike have now been complemented by a healthy sunburn! Thanks for the voyage, dear.